The “Interdisciplinary Encounters” conference will take place within the University of Illinois – Urbana-Champaign’s Levis Faculty Center, located on-campus at 919 W. Illinois St., Urbana, IL, 61801. More information about venue accessibility here. Public Transit: The 22 Illini and 220 Illini (Evenings/Weekends) both stop at the Illinois Street Residence Hall bus stop, located near the corner of Illinois St. and Gregory Ave. Additionally, the 5 Green and 50 Green (Evenings/Weekends) both stop at the Green & Gregory bus stop, located one block north of the center. Bus fare on both routes is one dollar per ride. More information regarding transfers and routing can be found on the Champaign-Urbana Metropolitian Transit District website. Car: Metered parking can be found underneath the adjacent Krannert Center for the Performing Arts, as well as in lots adjacent to and north of the Levis Faculty Center. On Saturday, free, no-permit-required parking is also permitted in additional space in those lots, particularly lot D22 at 905 West Oregon St., near the Levis Faculty Center. Additionally, plentiful street parking will be available on Saturday. Please note that metered spaces may have a specified time limit. Please follow all appropriate signage, and note that on-campus parking may be limited and/or expensive on Friday. For more information, view the University of Illinois parking website. By Car: Take Dunlap north to Green St. Turn right on Green St. Turn right on Goodwin Ave. Turn left on Illinois St. The Levis Faculty Center is at the corner of Illinois St. & Gregory Ave. Please note that public transportation is not available from Willard Airport. Public Transit: Take either the 5E Green or the 50E (Evenings/Weekends) Green bus to the stop at Green and Gregory. The Levis Faculty Center is one block south of the stop. By Foot, Bike, or Car: Take University Avenue east to Goodwin Avenue. Turn right on Goodwin Avenue. Turn Left on Illinois St. The Levis Faculty Center is at the corner of Illinois St. & Gregory. The total distance is about 1.6 miles. 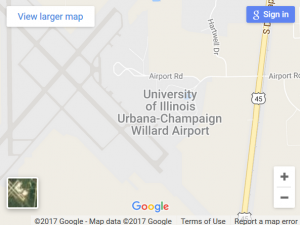 Buses are available from both O’Hare Airport and Midway Airport directly to Champaign-Urbana via services such as Peoria Charter. The approximate cost is $30 each way. Alternately, the CTA can be taken from either O’Hare or Midway to Union Station in Chicago, where Amtrak is located. From O’Hare, the Blue Line can be taken from to the Clinton St.station in Chicago for about $5. This station is two blocks north of Union Station. From Midway, the Orange Line can be taken to the Quincy station in Chicago for about $3. This station is three blocks east of Union Station. It is advisable to plan on 1:30 – 2:00 travel time from O’Hare to Union Station, and 1:00-1:30 travel time from Midway to Union Station. 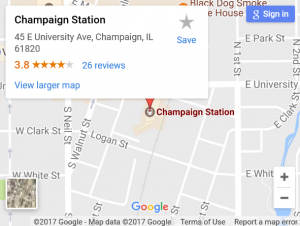 Amtrak tickets from Union Station to Champaign-Urbana can be purchased in advance for anywhere from $15 to $40, depending upon demand and time. There are three trains daily both ways. More information can be found at Amtrak’s website. I-57 can be reached via I-90, I-294, or I-80. Take I-57 south to I-74. Take I-74 east to the Neil St. exit. Go south on Neil St. Turn left on Green St. Turn right on Goodwin Ave. Turn left on Illinois St. 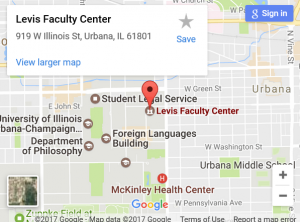 The Levis Faculty Center is on the corner of Illinois St. and Gregory Ave.
I-57 can be reached via I-70 or I-64. Take I-57 north to the University Ave. exit. Take University Ave. east to Goodwin Ave. Turn right on Goodwin Ave. Turn left on Illinois St. The Levis Faculty Center is on the corner of Illinois St. and Gregory Ave.
I-74 can be reached via I-65, I-69, or I-70 (via I-465). Take I-74 west to the Lincoln Ave. exit. Go south on Lincoln. Turn left on Illinois St. The Levis Faculty Center is on the corner of Illinois St. and Gregory Ave.
I-74 can be reached via I-80 at Davenport. Take I-74 east to the Neil St. exit. Go south on Neil St. Turn left on Green St. Turn right on Goodwin Ave. Turn left on Illinois St. The Levis Faculty Center is on the corner of Illinois St. and Gregory Ave.